Purpose: To provide property managers with insights on how maintenance agreements can benefit their facilities. Why should a property manager consider a maintenance agreement? Does proactive maintenance really pay off? What are the key qualities of a successful maintenance agreement? 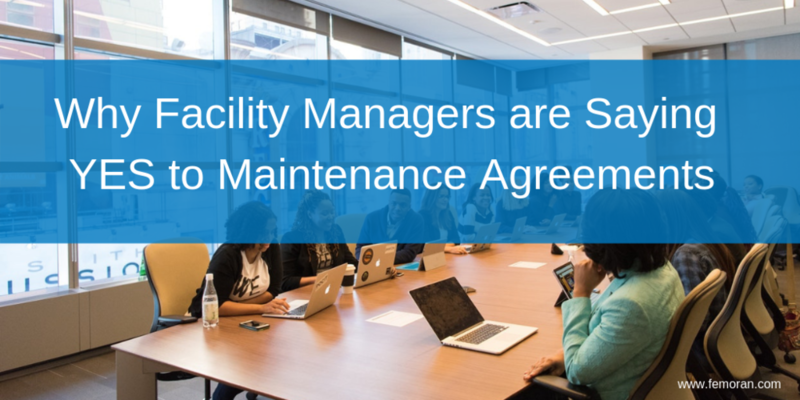 Facility managers are saying ”yes” more and more often to maintenance agreements. The benefit is clear. Facility and maintenance managers are busy and don’t always have the time or tools to maintain complicated systems, like HVAC. By having a maintenance agreement, maintenance professionals can focus on their day job and less on systems that require too much time and/or specialized knowledge. Additionally, the top concern for facility managers is energy efficiency. Your goal remains steady: reduce energy costs. Maintenance agreements will do just that. Ensuring the HVAC system is right-sized and efficient as possible. Poorly maintained HVAC is a major cause of higher energy bills, and maintenance agreements will solve that. A maintenance agreement is a contract that outlines expectations regarding equipment, building, and other technology maintenance in case of a facility mishap or emergency. Typically, these agreements are set up on an annual basis to guarantee ongoing services and upkeep throughout the year. Maintenance agreements prove to be extremely helpful for facilities. They lay the groundwork for contacts, fees, and frequency of scheduled maintenance. You might consider entering your facility in a maintenance agreement with your HVAC, plumbing, or landscape provider to ensure continuous upkeep and optimal performance. Efficient systems lower utility bills. Training costs are minimized as you contract expert technicians. Fewer and less significant repairs are needed on well-maintained equipment. Extended warranties can be applied to equipment under maintenance agreements. For example, a one-time fee between $3,000 and $8,000 is typically required to replace a boiler. However, a maintenance agreement is an annual investment in your facility that will provide full-service and comprehensive maintenance throughout the year. Contracts are most effective when they incorporate proactive maintenance. This type of maintenance focuses on improving facility conditions through continuous upkeep and repairs. By addressing maintenance proactively, the facility to make minor changes — usually while continuing production as usual — rather than having to halt production for a major repair. Outline of each party and services involved. Details of the full range of tasks to be provided. Expected response time for typical and emergency situations. Compensation agreement, including the amount paid and payment frequency. Stipulations regarding a breach or termination of the agreement. By making sure your maintenance agreement includes these details, you’ll set yourself and your facility up for future success. What are the key components of your facility’s maintenance agreement? Maintenance agreements are a good choice for facilities that want to be proactive about their building’s systems. Be sure to consider the benefits of proactive maintenance agreements and how they will fit into your property. Then, create an agreement that is unique to your facility with the guidelines above. Before you know it, your facility will be prepared to face any challenge that comes its way.